Ten-80 is happy to announce the signing of three time World Champion Andrew Adkison. Ten-80 welcomes Andrew to its diverse team of athletes and its continuously growing family of riders. As one of the top professional wakeboarders in the world, Andrew has shown he can compete and dominate at all disciplines of the sport. With his technical style of riding and precision of detail in his tricks, we as a company intend to incorporate these qualities into the future development and production across our entire product range. 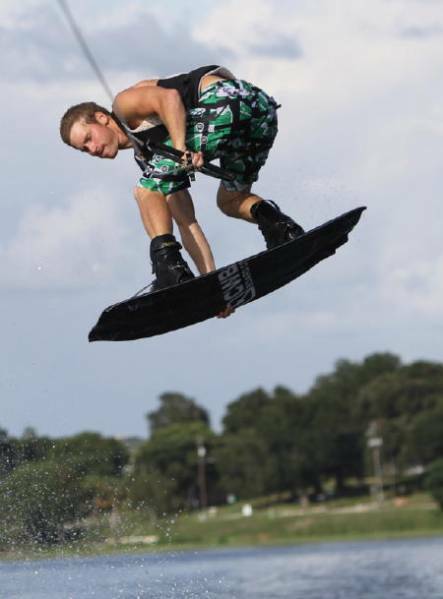 Andrew says, "I'm excited to be a part of a company and a team that is wakeboarding. �I was drawn to Ten-80 because of their commitment to their people, their products, and our sport. �I'm honored to be a part of this. �Wether it's in the states or overseas I've noticed for several years that Ten-80 truly supports wakeboarding at all levels. From the top boat and cable tournaments in the world to their local dealers events. �It's easy to see that Ten-80 is growing a solid brand while expanding our sport. �That's something I want to be a part of." Earlier this year Ten-80 announced the signing of Keith Lidberg and the partnership to create and launch his personal collection, Three. With Keith's new collection and the signing of Andrew Adkinson, the 2010 season is shaping up to be an exciting time for Ten-80. Keep your eyes peeled for some stylish new threads being released and some fresh new faces rocking the Ten-80 gear next year. Visit www.ten-80.com for all the other news and info happening in our sport. Ten-80 is a division of Fluid Distribution Inc. For more information about Ten-80 or any Ten-80 products please email Ten-80 at info@Ten-80.com or call (800) 915-1080.